The polling releases on the day following the vice presidential candidate showdown in Danville last night were fairly light. Light or not, they continued to show if not movement toward Romney, then a narrowing of the margin between the two candidates. The truth is that it is a combination of the two. Here are the seven new surveys from six states almost all in the middle -- most competitive -- column on the Electoral College Spectrum below. There have been six polls conducted in Colorado since the Denver debate, and Mitt Romney has led in four of them. In three of those surveys the lead has been only one point. That is the case in this Survey USA poll as well. And that has a lot to do with the type of change witnessed in the Centennial state. The gap is drawing closer, but continual Romney +1s are going to make that change slow in coming about in the FHQ weighted averages. The picture is slightly different in the Sunshine state. FHQ mentioned yesterday that Colorado in some respects looks now an awful lot like Florida did before the debate. There were some blips on the radar, but most of the polls were +1 in one direction or another. Florida has, like most states, slid a bit to the right -- toward Romney -- in the time since that first debate, so that now instead of Obama and Romney trading slight leads from poll to poll, Romney has a pretty consistent one to three/four point lead. If that persists, we'll be talking about when Romney has the lead in the FHQ averages in Florida not if. The Great Lakes state, too, has seen the polling margins shrink post-debate. 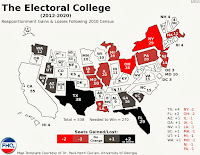 But that probably is not in a way that is going to allow Romney to take advantage; at least not in terms of winning Michigan's 16 electoral votes. Michigan seems like a state where Romney can perhaps force the Obama campaign to use some resources -- which is certainly strategically useful -- but will continue to be just out of reach on election day. FHQ could be wrong, but Michigan has been, for the most part, a Lean Obama state all along, but one that hovers close enough to the toss up line to warrant attention. 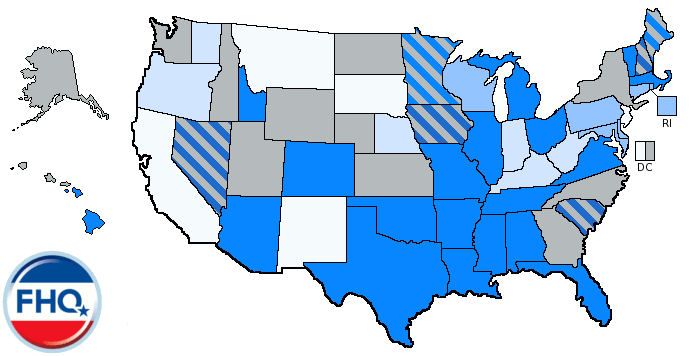 New Hampshire continues to be underpolled for as close as it has been or if not for as close as it has been then considering the company of states it has clustered around in the rank ordering of states here at FHQ. We have just two post-debate polls from the Granite state and they both indicate a close race. Unlike the Rasmussen survey -- which saw a three point Romney lead turn into a tie after the first debate -- the ARG poll shows a decided shift toward the former Massachusetts governor. A 50-45 Obama advantage has now almost completely turned in the opposite direction (50-46, Romney). But that still is not a lot in the way of data in the Granite state. It is some, but not a lot to build confidence in the true measure of the state of play there right now. 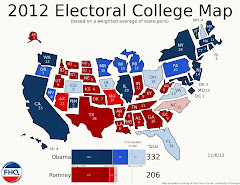 Virginia, like Colorado and Florida, is one of those red on one side, blue on the other states in the poll table above. There have been six polls released from the commonwealth since the debate, and like Colorado, four of those six have tipped toward Romney. And half of those four have been one point leads for the governor. There is more (and clearer) evidence of a shift in Virginia than in, say, New Hampshire, but the change is slow in the averages given the extent of the margins. Poll-over-poll, this Rasmussen survey shows Obama losing a point since last week and Romney holding steady. That is hardly anything outside of the "it's just statistical noise" argument. But again, this is a state where, if the data persists, it will track closer and closer to parity and/or a slight Romney advantage. None of the seven survey releases today did much of anything to change the FHQ graphics, but the trajectory of underlying change continues. The race is tightening and the space between states and/or various groups of states that had developed prior to the first debate is disappearing as the FHQ weighted average margins compress. As the race moves closer to election day, one thing to eye is the extent to which daily polls differ from the FHQ averages. There is, for instance, a lot of red versus blue on several of those lines in the poll table at the top. This comes back to an issue that I have raised in the past: the trade-off between measuring a true change in any given state and (over-)responsiveness to new polling data. It is pretty clear that Mitt Romney has gained quite a bit of ground in Virginia-Florida group of states in the Electoral College Spectrum below. And by gained quite a bit of ground, I mean that in some cases -- on other sites that do similar poll aggregating -- those states have tipped over into Romney's column. Again, FHQ enjoys its conservative posture on this issue; when a change occurs here, it is evidence of a lasting change. But at the same time, I'm sympathetic to the argument that, "Hey, this just isn't that responsive to changes on the ground in this race." It is a fair criticism. One thing that we did in 2008 -- that I've toyed with doing in this race -- is to increase the weight of the most recent poll (or polls sharing the same dates) as a means of making the averages slightly more responsive. [It should be noted that in the past I have discussed this formula alteration in terms of decreasing the weight on the older polls. No matter how I discuss it, the same thing is being done. A change in older polls' weighting is always relative to the more recent poll(s) and vice versa.] Fine, let's check in on what this more responsive weighting formula would look like. The premise is simple: double the weight of the more/most recent poll(s) relative to the older, archived survey data. How does that affect those three states (Colorado, Florida and Virginia) where there is probably enough evidence to suggest a possible change in which candidate is leading there. Things change only minimally in Colorado. A 1.76 point Obama advantage shrinks by only 0.1 points. In Florida, Obama would continue to lead, but would have a nearly 0.8 point edge reduced by 0.2. Again, only slightly more responsive. For the Old Dominion, the Obama lead is cut by a margin in the neighborhood of 0.15 points. That compresses things more, retains the current ordering of those three states, but fails to push any of the three over into the Romney column. I don't know if that's right or not, but I did want to give folks a bit of a glimpse into what the averages would look like in a handful of competitive states right now if the formula was changed. And mind you, this was a formula switch that I wanted to have in place just prior to debate season, but held off on. Let's see where things go through the rest of debate season -- as is -- and then if it is necessary to adopt the slightly more responsive formula following debate season, then that change will be made then. Perhaps you can tell that FHQ felt like it had a bit more space to flesh the above out; more space than usual anyway. That is a function of the complete lack of change these polls introduced today. 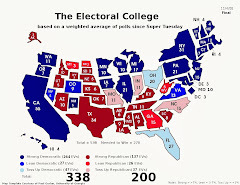 The averages got tighter, but the map and electoral vote tally remained unchanged as did the Electoral College Spectrum below. And guess what? The same is true on the Watch List. The same seven states from yesterday are here again today and Florida, Nevada, New Hampshire and Ohio are still the four on there that are most worth eyeing moving forward.